The June 2016 State of Oregon Economic Indexes of was released today. Full report is available here. We thank KeyBank for their generous support of this project. 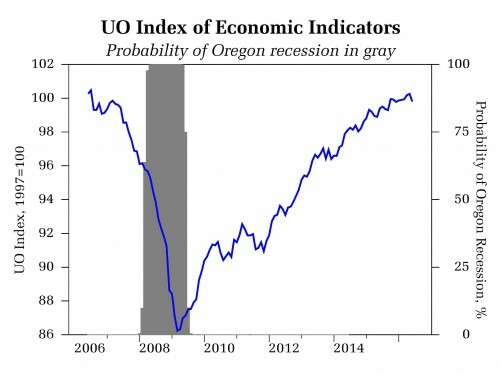 The Oregon measure of economic activity fell to 0.57 from an upwardly revised May figure of 0.81. The three-month moving average, which smooths month-to-month volatility in the measure was 0.77, where “zero” indicates average growth over the 1990-present period. The manufacturing sector remained in modestly positive territory on the back of fairly strong average weekly hours worked in the sector. The construction sector impact was again effectively neutral. The household sector remains very supportive of the overall measure. The low unemployment rate and level of initial unemployment claims indicate the labor market remains healthy; growth in employment services (largely temporary help firms) has faltered, however. Following national trends, employment services payrolls slipped and are overall tracking generally sideways in recent months, consistent with some loss of momentum typically seen in later stages of a business cycle. This could, however, be a reflection of temporary weakness in manufacturing as the impact of lower oil prices and stronger dollar continues to pass through sector. The interest rate spread narrowed sharply in the wake of Britain’s vote to leave the European Union, an event that pushed down longer term yields worldwide. Together, these indicators suggest ongoing growth in Oregon at an above average pace of activity. 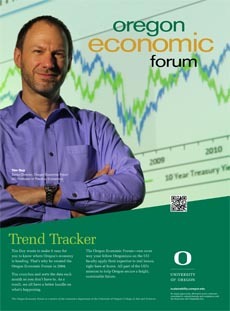 The ongoing US economic expansion provides sufficient support to sustain Oregon’s economy for the foreseeable future. The UO Index typically moves sideways as a business cycle matures. Such behavior is thus expected for an expansion that is now seven years old.